This title was first published in 2001. This stimulating and well-written text is particularly suitable as a subsidiary text for courses in politics, sociology and ethnic studies. 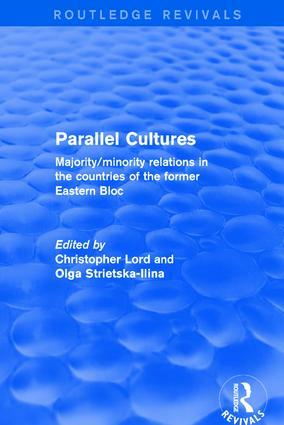 Contents: Parallel cultures, Christopher Lord; Competing cultures, conflicting identities: the case of Transylvania, Gavril Flora; Transformations of ethnic identity: the case of the Bulgarian Pomaks, Madeleine Danova; The identity crisis and emergence of alternative ethnic identities among the Eastern Slavs: the case of the Poleshuks, Kirill Shevchenko; Inter-ethnic coexistence and cultural autonomy in Ukraine: the case of the Donetsk region, Kateryna Standnik; Quo vadis? the case of Russia, Olga Strietska-Ilina; Index.